Dogs cool off by panting, exchanging warmer air from the body for the cooler air outside. They do not sweat to cool off the way humans do, although they can release some moisture through the pads of their feet. The average body temperature for a dog is between 100- 103 degrees and when the outside temperatures reach 85 – 90 degrees or more, cooling off becomes more difficult for the dog. 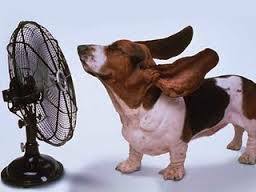 Exercising during the heat, even just a walk, increases panting and loss of body fluid begins. Short nosed breeds such as pugs, bulldogs, boxers, and the Pekinese can overheat more quickly because they can not exchange air as efficiently. Recognizing this will help you to help your dog in the hot summer months. Most of us have heard that leaving a dog in a car, even with the windows rolled down while you pop into a store for something can be fatal. The inside car temperature can jump quickly on warm days as well as overcast days due to the concentration of UV rays penetrating the car’s windows. If you choose to leave your dog outside at home, make sure that the dog has plenty of cool fresh water to drink and plenty of shade. Dog runs and tie downs for dogs can be a hazard when the sun changes position and the shade moves or disappears completely. You may have to provide a shade umbrella, small wading pool, or extra bins of water. We recommend having your vet’s contact information in your phone just in case you need it in a hurry when you are out and about and you may even want to make a list of the animal emergency clinics that are close to your home as well. Prevention, knowledge of your dog’s normal behavior and being prepared will help you to enjoy the outdoors with your dog safely in all types of weather.